When it comes to fitness, there is one workout that everyone can do! Walking is the perfect exercise for all fitness goals: whether you’re trying to lose weight, gain strength, or just get started! I make the effort to walk every day — every evening we take a family walk around the neighborhood, weather permitting. We also squeeze in a walk anywhere we can: parking near the back of the lot when we go shopping or choosing the stairs instead of the elevator. Why is walking so important to us? 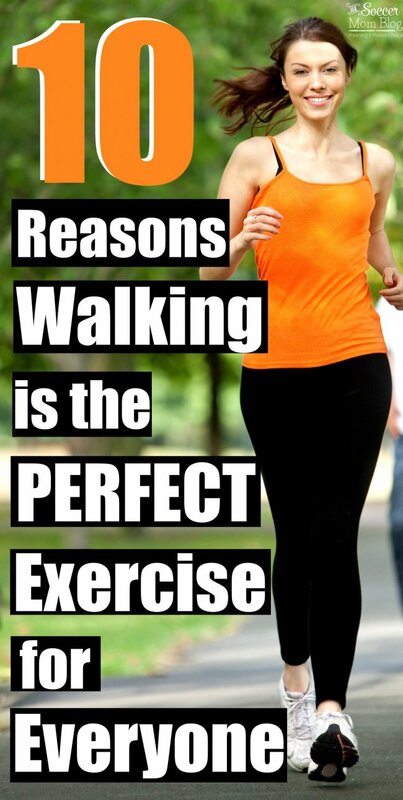 If there ever were a perfect exercise, walking would be it! Read on for 10 amazing benefits that will make you a walking addict too! Who says you need an expensive gym membership to lose weight? Walking is free to do in public places and does not require special equipment. Can’t beat that! In your neighborhood. At the park. At a local walking track. At the mall when the weather is bad. There are always places to walk, and you won’t have to look very far to find them. One of the most common excuses I hear from other parents as to why they don’t exercise: “the kids keep me too busy.” So take the kids with you! Kids can walk, and it’s good for them too! When kids are exposed to healthy habits at a young age, they are more likely to make positive lifestyle choices as adults. Make exercise a priority for your family and you’ll be setting your kids up for better health for the rest of their lives. For more fun family exercises, try this 10-minute yoga routine for kids or this playground workout. During my pregnancy, I primarily did two things to stay in shape: yoga and walking. By my tenth month, walking was the only physical activity I could manage. My nightly walks around the neighborhood kept me sane, helped with my restless legs, and probably helped prevent me from gaining more weight than I did! Unless your doctor advises otherwise, walking is the perfect exercise when you are pregnant! If you’re counting down the day until your due date (or past your due date), walking is often recommended to encourage labor. For these reasons, your doctor will likely recommend that you start walking as soon as possible. This is one bit of advice that you’ll definitely want to heed! There are endless modifications to make walking as challenging as you can handle. However, walking is safe and low-impact, making it the perfect exercise for beginners and those with previous injuries. Whether you’re new to town, or simply looking to expand your circle of friends, walking is an excellent way to do so! You can find meet-up groups through online forums, churches, schools, or even your employer. If there’s not a group yet in your town, create one! Making friends and getting fit at the same time is a definite win-win! On days where I start to feel “blah” (also known as the “mom funk”), walking is one of my go-to strategies to instantly improve my mood. Sometimes a change of scenery and physical activity is just what you need to turn the day around! When I walk through my neighborhood, there is always something new to see! People, animals, construction, and even gorgeous sunsets — walking is always entertaining. MUCH more interesting than plugging away on a stair-stepper at the gym, staring at a wall. Walking was an integral part of my postpartum fitness regimen that helped me lose 42 pounds. My mom walked off her baby weight after each of her three pregnancies. In her 50s, she is in the best shape of her life because she walks — every single day. For tips to stay motivated, check out these 10 Tips to Walk Off the Pounds from My Think Big Life. Follow Stacey @ The Soccer Mom Blog’s board Positive Lifestyle on Pinterest. *Disclaimer: This post is based on my own personal experiences; I am not a medical professional. Please consult your physician before beginning a new fitness regimen.